Dr. A. P. J. Abdul Kalam (1931 – 2015), an eminent scientist, is well known as a visionary for India 2020. His rich personality and manifold skills as a scientist, philosopher, leader and wonderful teacher are an inspiration for millions of young minds. He is also entitled as the Missile Man of India for his work on the development of ballistic missile and launch vehicle technology. He is the recipient of numerous awards for his extra-ordinary contribution to scientific research and modernization of defense technology in India. These include, the Padma Bhushan (1981), the Padma Vibhushan (1990), Bharat Ratna (1997) and the Von Braun Award (2013) from the National Space Society. 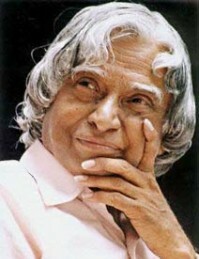 Abdul Kalam was born on 15th of October 1931 in Rameshwaram, Tamilnadu. His father Jainulabudeen was a boat owner; his mother Ashiamma was a housewife. Kalam was the youngest of four brothers and a sister. From his early childhood, he developed a keen interest in reading books. His neighbor, Mr. S. T. R. Manickam remembers, “I used to have a library and Kalam was always there. He used to read everything he could lay his hands on.” Although the family’s financial conditions were not good, his family was always supportive of Kalam’s higher education. After completing his studies at Schwartz High School, in 1950 he enrolled at St. Joseph College, Trichy, to study B. Sc. Physics. In 1955, he became a student in the department of aerospace engineering at Madras Institute of Technology. Kalam also received honorary doctorates from 30 universities. Throughout his student life, staying away from his near and dear ones, he often felt homesick. His constant companions were encouraging words, moral values, faith in the divine and positive attitude, which he imbibed from his family members, childhood friends and teachers. Hard work, honesty and self-discipline enabled him to achieve his dreams of flying high in the sky. Kalam joined Aeronautical Development, Establishment of Defense Research and Development Organization, Bangalore, as a chief scientist. Later, at Indian Space Research Organization, he was the project director of India’s Satellite Vehicle (SLV-III). In the 1980s and 1990s he headed India’s missile programme, developing its indigenous nuclear-capable Agni and Prithvi missiles. He also helped develop a low-cost coronary stent and co-designed a rough and ready tablet computer for workers’ healthcare in rural areas. He was the Scientific Adviser to Defense Minister and Secretary, Department of Defense Research & Development, from July 1992 to December 1999. He was elected as the 11th president of India in 2002. Later, Kalam served as a visiting professor in various esteemed institutes and universities of India. He reached to the students across the country by means of his personal interactions but also through his publications such as, Wings of Fire, India 2020 – A Vision for the New Millennium, My journey and Ignited Minds – Unleashing the power within India, etc. Apart from being a scientist, Kalam was also a man of faith and belief. He expressed his conviction about the presence of the divine, “I feel convinced that there exists a divine power that can lift one up from confusion, misery, melancholy and failure, and guide one to one’s true place.” He inspired the younger generation to dream big and, at the same time, conveyed the importance of prayer and faith for achieving their dreams. In his words, “One of the important functions of prayer, I believe, is to act as a stimulus to creative ideas. … God, our Creator, has stored within our minds and personalities great potential strength and ability. Prayer helps us tap and develop these powers.” As a child, Kalam would accompany his father to listen to the religious discussions between his father, Pandit Laksman Sashtri and Reverend Father Bodal. These discussions highly influenced Kalam’s thought. His father’s friendship with men of faith was indeed an example of harmony among people with various beliefs and of the integration of thoughts from the Holy Quran, the Old Testament and the Bhagavad Gita. His life history exemplifies simple living and high thinking. The following remark expresses his humble attitude, “Each individual creature on this beautiful planet is created by god to fulfill a particular role. Whatever I have achieved in life is through his help, and an expression of his will. … I am merely praising his glory.” His spiritual journey was the subject of his final book, Transcendence: My Spiritual Experiences with Pramukh Swamiji conveying the vision of a fusion between science and spirituality.